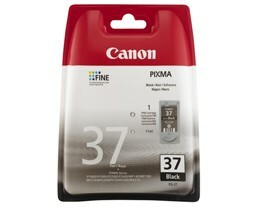 Genuine Canon PG-37 Black Ink Cartridges are the best choice for your Canon Pixma iP1800 or iP2500 inkjet printer. With Canon’s special fade-resistant black ink formula, you know that all your prints will come out looking their best, with accurate coverage, deep colour, and minimal smearing due to fast drying times. Canon recommends using their branded products in order to keep your printer running and working its best, and using non-compatible cartridges can even void your warranty, so Canon PG-37 ink is well worth using for your home and business printing. You’ll even save money due to less ink wastage, and you can make even greater savings when you buy in bulk.